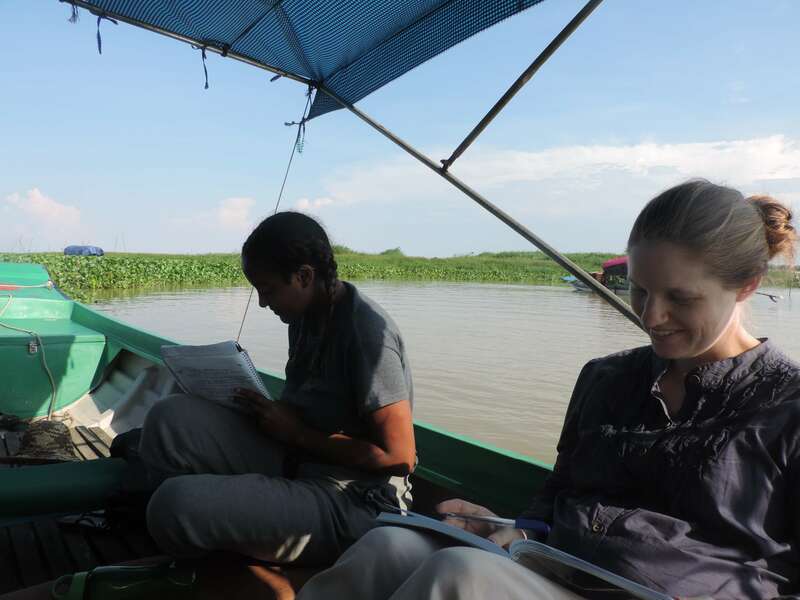 Five students, one intern, one professor, and two translators get in two fiberglass boats on a shallow, muddy stream. It’s not long until our boats get stuck, so we jump out of our boats and push until we get to slightly deeper water. 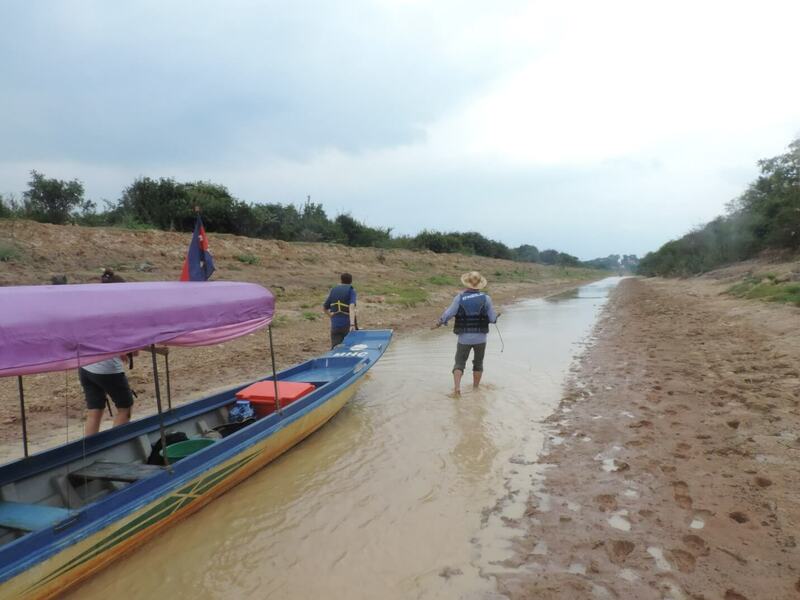 Just the journey to the Tonle Sap Lake requires this directed research team to be a little intrepid. 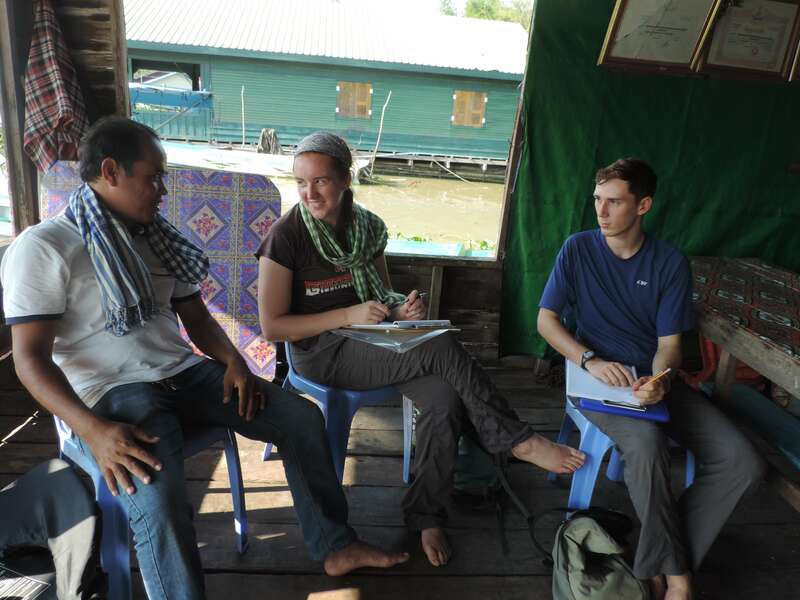 During the ten days of research collection, the students on this DR team are conducting interviews to collect information about changes in weather and climate on the lake, the links between environmental factors and human migration, and national policies related to climate change and migration. As a student on this program, I also did my directed research project on the Tonle Sap exactly two years ago, so it’s been rewarding to be a part of the research process again, and to return to the lake—a place that continues to deeply fascinate, perplex, and matter to me through my experiences there. I also had the opportunity to spend four days on the lake in January before the spring semester started. During this time, I conducted some initial research the links between climate change and migration under the guidance of our Environmental Ethics and Development professor, Dr. Georgina Lloyd-Rivera, to help conceptualize and lay some groundwork for the students’ DR projects. The Tonle Sap is a place I keep coming back to, and it’s a place that I hope I will be able to keep returning to. It’s not a certainty for me, though—the future of the Tonle Sap is murky and unclear. Environmental and social conditions on the Tonle Sap are changing so rapidly that every time I do come back, it seems like there is another layer of the story that unfolds. The challenges on the lake are myriad: while these communities are strongly dependent on the fishery resources of the lake as the foundation of their livelihoods, the amount and size of the fish catch has been in decline over the past few years. 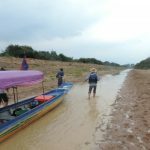 The reasons for these declines are complex and interconnected, from changes in fisheries governance, increasing populations, and overfishing to increasing temperatures and drought, which have resulted in lower water levels and unprecedented forest fires in the flooded forest that surrounds the lake. I have asked questions and listened to the stories and struggles of many families living in the villages near the Prek Toal Core Area of the Tonle Sap, and while I have an informed grasp on the struggles and challenges that these communities are currently facing, I have absolutely no idea what their futures will be. As people find it more and more difficult to acquire the dwindling natural resources that rely upon, causing some to try even harder with more time and equipment devoted to capturing fish, and others migrating away from the lake to seek and alternative livelihood in towns and cities elsewhere, it is unclear to me whether the options still exist that can make livelihoods in this are sustainable. I do believe there are possibilities for recovery here, but I cannot imagine how these paths toward recovery could be attained significant support and actions taken that can shift the trajectories of many of these concerning trends. To me, the precarious position of the Tonle Sap is representative of many ecosystems and communities around the world that are in the midst of this kind of transitional phase. We are at a threshold in so many places, an edge state where infinite final options still exist: the system could collapse, or we can pool together the necessary resources to bolster its resilience and set the course towards recovery and eventual flourishing again. In these gray and hazy states, we may be disheartened by the grim outlook based on the patterns we observe around us, but we have to remind ourselves that the outcome is still undetermined. This is not the period in which hope becomes foolish or unwarranted—this is the period when hope is most necessary, insofar as hope instigates us to take action for the real possibility of a better future. This is the time when thoughtful, strategic, coordinated interventions matter most, because they can truly change the course that we have charted for ourselves thus far. Being a part of SFS has been a key way that I find my hope even as we come face to face with the stark realities and critical challenges of environmental degradation, because I see the strength of commitment, conviction, and capability of both current and emerging leaders engaged in the global mission of environmental protection. As a community of people united by deep care for the future of our planet and its people and a strong belief the importance of taking action, it encourages and inspires me to be a part of SFS because I know I do not stand alone in looking to a better future and taking steps forward in the direction to create the world in reality that we courageously dare to imagine.